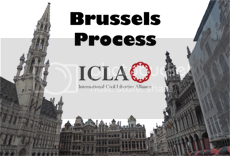 Protecting the right of freedom of assembly is a component of the 2012 Brussels Process which ICLA launched at a Conference in the European Parliament back in July 2012. 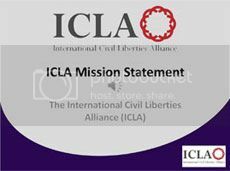 Click the button below to sign The Brussels Declaration To Safeguard Individual Liberties And Human Rights. Spread the word about The Brussels Process. Right to Peaceful Assembly – Only For Some? In light of the above, BPE would like to draw attention to the OSCE Guidelines to Freedom of Assembly which specify that “The state has a positive duty to actively protect peaceful assemblies.” Furthermore, the state is required to protect participants of a peaceful demonstration from any person or group that attempts to disrupt (…) it in any way. While the German government and the German police forces are to be commended for allowing demonstrations and rallies to take place without hindrance [ref. Paper presented by ICLA – International Civil Liberties Alliance – to HDIM, Sept.29, 2009], BPE notes with grave concern recent events in the United Kingdom, where legal demonstrations have turned into police interrogations of the demonstrators and the organizers, and where those opposing the rally using violence were not arrested, let alone detained, because police deemed an arrest “unsafe” in a hostile environment. The English Defence League (EDL) held a peaceful outdoor meeting in Walthamstow on September 1, 2012. The meeting had been negotiated between the EDL and police liaison officers well in advance, and it was a legal one. In the meantime, the main EDL demonstrators, numbering about 400-500, had been kettled in a side street. The counter-protestors tried to break through the police line again, when the organizers were told that the situation had become uncontrollable and the meeting had to be canceled. The main EDL contingent was told to leave or face immediate arrest, and leave they did. The EDL speakers were escorted out of Walthamstow in the vehicles they arrived in, but not before the UAF and its associates had photographed the license plates. Police refused to confiscate the film, despite knowing the security implications. Why did the police allow the EDL group to be attacked with potentially deadly bricks and bottles for over an hour? Why did the police not arrest a single person carrying out these acts of violence? Why did the police kettle a peaceful group of EDL supporters for hours and withhold water and toilet facilities? Why did police arrest many of these supporters on false grounds and later “de-arrest” them after taking them to various parts of London? We note that these police actions – false imprisonment and blatant disregard for upholding the law and order – are a matter of great concern. In addition, we note that this is not the first time, and we fear that it will not be the last time that the right to peaceful assembly was trampled by lack of proper police protection. It is the nature of a functioning democracy to allow dissenting opinions. Whether or not one agrees with the EDL’s views, it is the democratic state’s duty – in line with its OSCE commitments – to protect those demonstrating peacefully. It now appears that the democratic right to freedom of assembly is only applicable to some members and groups. It appears that dissenting opinions are no longer tolerated in the United Kingdom. Dissenting opinions are crushed by force, intimidation, and inconvenience. This is indeed a very worrisome trend. – calls on the OSCE participating States to ensure that OSCE guidelines to freedom of assembly as well as its human dimension commitments are followed and implemented by governments in all instances of legal assemblies, thereby ensuring the continued legal right to the very freedoms that should be inherent in liberal democracies. – Recommends that ODIHR reaffirm the right to peaceful assembly for everyone regardless of whether one agrees or disagrees with the views of the demonstrators.